From helping others in times of need, to keeping and maintaining friendships, to having a positive attitude, Laura's words of wisdom in Writings to Young Women from Laura Ingalls Wilder: On Wisdom and Virtues are applicable even in today's world. As she shares stories and experiences from her own life, she encourages readers to live lives of integrity and to realize their dreams. 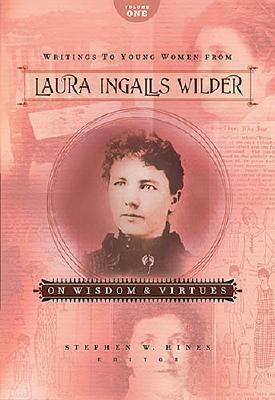 I enjoy reading books that have anything at all to do with Laura Ingalls Wilder as she is an idol of mine. This is one of a few books that have Laura's articles she wrote for the Missouri Realist in it. The way she writes is fitting for today as it was during her lifetime. Here is quote from one of her articles that I liked: "While blue is without a doubt a heavenly color, it is better in skies than in one's mind ..." Very fitting. I also found this very fitting as how to make your life more simple seems to be the theme in a lot of books and magazines. In January 1924 Laura wrote an article about how to simplifying your life. I thought we could all go by her advice. She said "Here is a good New Year's resolution for us all to make: To simplify our lives as much as possible, to overcome that feeling of haste by remembering that there are just as many hours in the day as ever, and that there is time enough for the things that matter if time is rightly used." She was a very wise woman on so many things. I look for to the next book in this series. Laura Ingalls Wilder was born in 1867. She began writing, at sixty-five, a series of eight children's books about her life in the pioneer west. These books were later turned into a world-reknowned TV series, Little House on the Prairie. We all came to know and love Laura and her family through these books and the TV series (now in syndicated reruns). She died in 1957. Stephen Hines has published both fiction and poetry but is best known as a "literary prospector" who has brought back forgotten works by famous children's author Laura Ingalls Wilder, and works by Louisa May Alcott, and Sir Arthur Conan Doyle. His researches have taken him from the Herbert Hoover Library in West Branch, Iowa, to correspondence with British researchers dealing with the works of Sir Arthur Conan Doyle in the United Kingdom. More than half a million copies of books he has collected and edited are in print, and he has had three bestsellers: Little House in the Ozarks, "I Remember Laura", and The Quiet Little Woman. He continues to write fiction and poetry and has been a newspaper humor columnist for seven years.